in central Edinburgh, sleeping 1-5. 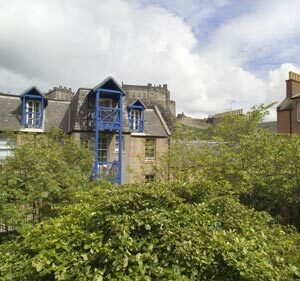 The view from the apartment over Cordiner's Land apartments and gardens to Edinburgh Castle. Cordiner's Land is an historic Listed Building within the heart of the "Old Town" Grassmarket Conservation Area of Edinburgh. It is also within the World Heritage Area of Scotland's majestic Capital. Access to this delightful holiday property is via security entry-phone at 70 West Port, "Cordiner's Land". Above the main entrance is a reinstated stone with the emblem of the Cordiners (who were shoemakers and cobblers) and an inscription dating from 1696. To the rear of the building are flights of external stairs and balcony walkways leading to the private inner courtyard gardens and the modernised individual properties. 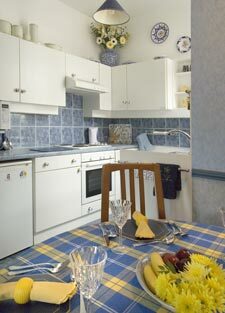 Refurbished to the standard of excellence required for Four-Star Self-Catering status from VisitScotland (formerly the Scottish Tourist Board), this compact apartment is fully equipped to provide modern accommodation for 1-5 guests. DVD Player (remote control) with complimentary DVD movies. Tea and coffee making equipment. All cookware, utensils, dinnerware, cutlery, etc. Dining table, table linen provided. Double bed with two bedside tables ie: the bed is not against the wall. Full size single bed on top. 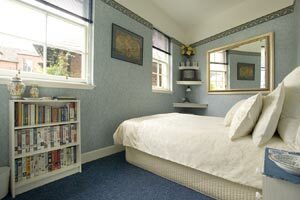 Comfortable 4' double bed below. Bath with power shower, basin and wc. Electric points for US and European shavers. Luxury towels in plentiful supply. Electricity, quality bedlinen, tablelinens, towels included. 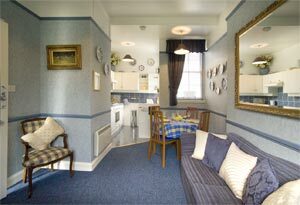 1-2 guests (double) can rent this property as a 'One-Bedroom Apartment' at reduced rates between 1 Oct - 31 May. Please enquire for full details. The apartment is at the end of the walkway. 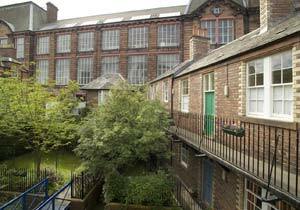 Behind, you can see the studio windows of Edinburgh School of Art. Please say you found 21 Cordiner's Land, through About Scotland! The Grassmarket area is at the foot of the precipitous Castle Rock, by the West Port (the ancient "Flodden Wall" gateway to the city). It's infamous past is linked to public executions, which took place at the east end of the Grassmarket and the notorious activities of Burke and Hare in the West Port. These days, the Grassmarket is a very fashionable and popular local area, which offers a wide variety of shops: specialty, second-hand and antiquarian bookshops, fashion, furniture, antiques, bric-a-brac and an abundant choice of dining, from sidewalk cafes and pubs to formal restaurants, all enhancing enjoyment of the summer evenings and long twilights. 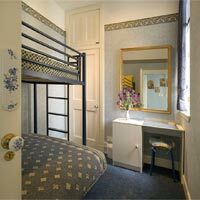 The Edinburgh International Conference Centre, Princes Street shopping, public transport, major theatres and attractions are all within a few minutes walk. The Grassmarket area is a browser's paradise, a "must" for visitors who wish to experience the full delights of Edinburgh. Explore, relax and enjoy this marvellous area, basking under the protection of Edinburgh Castle. 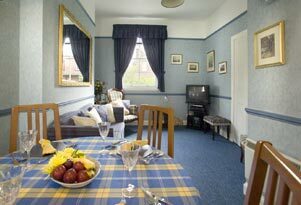 It is also a centre of activity during Edinburgh's famous festival periods.